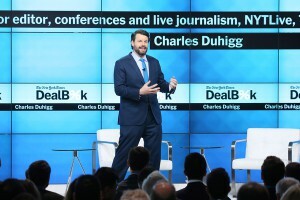 Charles Duhigg is a Pulitzer-prize winning reporter, graduate of Yale College and Harvard Business School and a frequent contributor or guest on The Colbert Report, NPR’s This American Life, Frontline and other programs. Mr. Duhigg has spoken to audiences as varied as MIT, the SC Johnson Company, the Aspen Institute and the Pasadena Art and Science Festival. As eloquent and engaging in person as he is on the page, Mr. Duhigg will have you rethinking your entire world. For information about inviting Charles Duhigg to speak at your event, contact The Harry Walker Agency or call 646-227-4900. Charles Duhigg is represented exclusively by The Harry Walker Agency.